SWBAT convert between pounds and ounces and add and subtract whole numbers, mixed numbers and fractions. In this task, students will participate in an activity that helps them convert and add ounces and pounds. I start this number trick by asking the students what weighs more- a pound of feathers or a pound of bricks? I use this question as a gauge to help me determine which students are not solid in their understanding of weight. Students may answer a pound of bricks. This is due to confusion concerning the weight or attributes of the objects being measured rather than an understanding of standard units of measure. To begin this lesson, I lead a brief discussion about how heavy a pound is and how heavy an ounce is. Students have had lots of experience with pounds and ounces. Based on an informal pre-assessment as well as a computer program my students use everyday, 98% of my students understand that there are 16 ounces in a pound. 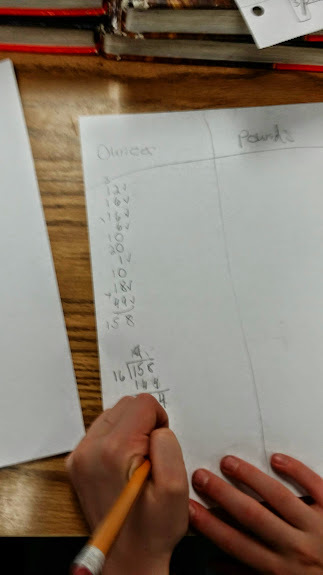 Students also have a good understanding that ounces are very light and that one pound is about the weight of a loaf of bread. Knowing this, I designed this lesson as a problem solving lesson in which students have an opportunity to apply this understanding. I begin by showing students a grocery bag. Dramatically, I pull out some play food items. (These are items listed on the grocery shopping list sheet.) I tell students they are going on a shopping trip and these are the items they are going to buy. Next I show student the grocery problem. I read through the problem with them and highlight the three different questions on the sheet. I do this so students understand that they are answering three different questions. Then I give students two pieces of plain white paper. I tell students that they have the entire rest of the class time to work on this problem. One paper is for their work and calculations and the other is for their answers and paragraph in presentation form. As students work, I circulate around the room observing and helping as necessary.